Wine with Erik! A puddle of bubbles! I am making up a theme for march right now and its going to be rainy spring? Sounds sad but I promise it wont be! I mean, who doesn’t love at least listening to the rain? For me it’s relaxing and makes me happy (but once I have to go out in it I get very grumpy haha) It also means that the flowers will start blooming soon and spring will have arrived. So I picked a wine that kinda fits this theme. 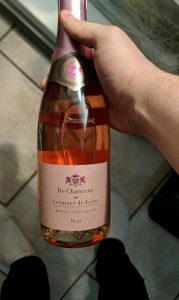 It’s a sparkling rose and I’ll explain why I picked it (with the help of some friends). I picked a sparkling rose because sparkling wines are fun to drink and the bubbles are what I am considering to be the rain, they both make a kind of gentle pitter patter sound don’t you think? The pink/salmon colour is representing the beginning of spring because its pretty and I said so. This sparkling is light, fruity and fun just like spring should be, we are leaving winter behind and warmer weather is coming, lets have fun! Okay now I think I’ll get into the wine! Here is a lovely sparkling to help bring in the spring weather. This wine isn’t overly complex but it still has fun aromas of strawberry, raspberry and grape fruit. The bubbles are light but creamy and the acidity is mouth watering with just a trace of sweetness to balance the wine. Easy drinking and super fun enjoy on its own or with a Caprese salad. Also on a side note, I’ve been doing this for, I think, 2 years now and I’m running out of ideas of what to do to and keep it fresh. I want to know what you guys want to see! So let Bruce know of what you guys want to see or themes you want me to do so I can get it for the next month. I’m thinking about doing this from now on, and I know there will be more than one idea for every month so I’ll try and shoes what I like the most or what is the most popular idea. Cheers guys!